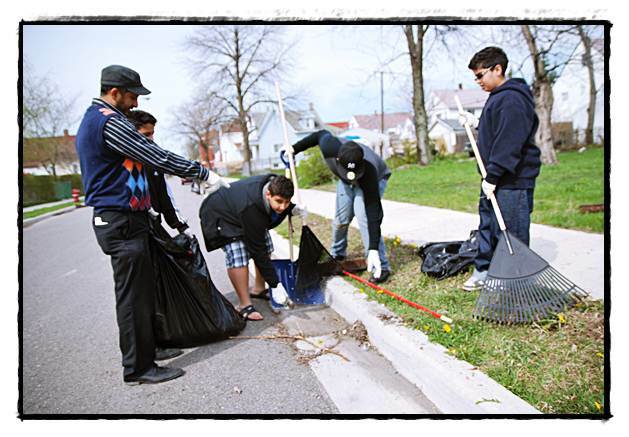 Volunteers will be needed for a citywide clean-up, called The Clean Sweep, coming up on April 20. Want to stay busy this spring? Though it may be five months away, the planning process for the Hamtramck Labor Day Festival has already begun. On Monday (April 8) at 5:30 p.m. at Cafe 1923 there will be a short volunteer meeting to get the ball rolling on this year’s celebration. The meeting will lay the groundwork for running the 2013 festival. Volunteers are needed to help with set-up and clean-up, beer sales, special activities and other events throughout the weekend. Also this week, on Wednesday (April 10) at City Hall there will be an organizational meeting for the Hamtramck Clean Sweep. The meeting will be located in the council chambers and starts at 6 p.m.
For the uninitiated, The Clean Sweep is an annual clean-up sponsored by the city and local businesses. Residents are invited help spruce up the town by collecting debris, edging sidewalks and performing other tasks that make the city more appealing. Even if you don’t have tools you can still participate. In past years shovels, rakes, brooms, gloves, trash bags and other materials have been supplied. There are also dumpsters located at strategic points throughout the city. This year there will be an electronic waste disposal dumpster at City Hall on April 18, and a tire disposal dumpster will be located on Vincent Street on April 19. The Clean Sweep will be held on Saturday, April 20. Volunteer locations will be at Acts 29 Fellowship and People’s Community Services. Afterward, lunch will be provided to all who participate. If you’re not too worn out from the Clean Sweep, on Saturday, May 11 from 9 a.m. to 3 p.m. Hamtown Farms hosts its 2013 Spring Volunteer Day. On the agenda is a day full of planting sunflowers, Pawpaw trees and other plants. In addition to planting there will also be learning activities for kids of all ages, as well as plenty of manual labor to do if you’re skipping the gym to help out. And like most events, lunch will be provided. Do you know of an event in need of volunteers? Does your group or business have an upcoming activity that needs some press? Call us at (313) 874-2100 or email news@thethehamtramckreview.com and let us know! Thanks for mentioning Hamtown Farms’ volunteer day on May 11th. There will be plenty to do for all ages. Lots of fun things for kids to do as well!